KIEV (JTA) — In a crowded room of the Tolkachov family’s tiny apartment here, a couch and twin bed sit kitty-corner from each other, sandwiching a small crib. In another corner, a wooden table is cluttered with a computer and some toys. Since October, three generations of the Tolkachov family — grandmother, parents and 22-month-old baby — have all slept in this one room. To keep clean what little space they have, everyone takes off their shoes when they come in. The Tolkachovs weren’t always poor. Ilya, 26, worked for an import-export business in Lugansk, the war-torn city in eastern Ukraine. His wife, Luba, 28, was an administrator at the local university. Ilya’s mother, Maria, lived nearby with her husband, a retired Ukrainian army officer. In his spare time, Ilya gave photography lessons at the local branch of Hesed, a Jewish senior citizens center. Last summer, the family began hearing explosions near their home in Lugansk. Ilya claims they saw Malaysia Airlines Flight 17 fall out of the sky in July after being shot down over Torez, Luba’s hometown. After the crash, the family packed some clothes and went to visit Luba’s family in Kiev, intending to stay no longer than a few weeks. They have yet to return home. So far, that better life has remained elusive. Ilya managed to find a job in his field, but due to the economic crisis that hit Ukraine because of the war, they make rent only with aid from Jewish organizations. His father remains in Lugansk, scared that he could be forced to re-enlist if he moves. The Tolkachovs’ story is common among Jewish refugees in Kiev who fled their homes in the embattled eastern Ukraine, where pro-Russian separatist forces have been fighting the Ukrainian army since last spring. Safe from bombs and gunfire, in the capital they face different hardships. The Ukrainian hryvnia has lost more than half its value against the dollar just since January, shattering the economy and making even staple foods expensive. Refugees say it’s hard to find work or places to live in Kiev, where many locals view them as hostile elements — culturally Russian imports from a separatist region who have brought crisis upon themselves. According to the United Nations, nearly 1 million Ukrainians have been internally displaced as of February. 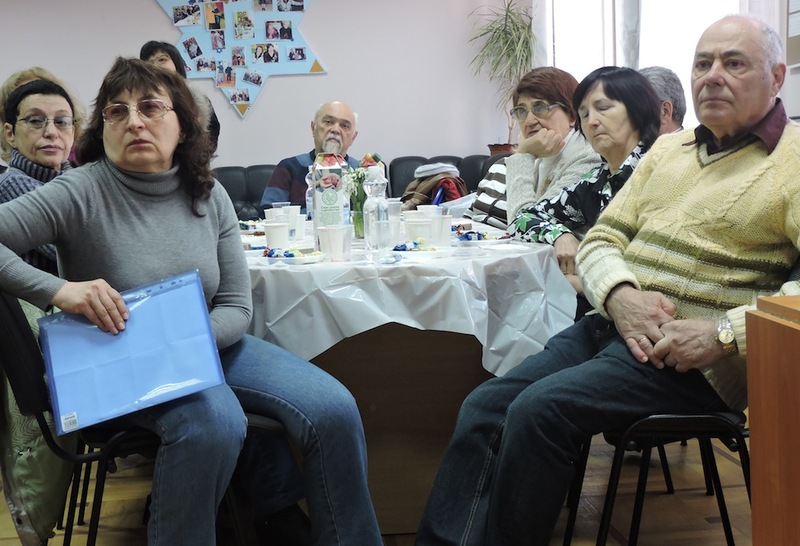 JDC has aided more than 600 Jewish refugees in the Kiev area with help from the International Fellowship of Christians and Jews, which has poured more than $19 million into Ukraine since December 2013. Through the local branch of Hesed and Beiteinu, a JDC center for youth and family programs, JDC provides newly arrived families three to six months of subsidies for food, clothes, toiletries, medicine and rent totaling up to about $250 a month. The centers also host programs for the elderly and families, as well as a Sunday school. Nina Tverye, who left the eastern city of Donetsk with her grandson in July and attends Hesed’s day programs for the elderly, said “it makes it feel better” to spend time with other refugees. Tverye said refugees spend all their time talking about the war. Children from the Russian-speaking east face the added challenge of integrating into Ukrainian-speaking schools. At Or Avner, a Chabad-run elementary and middle school in Kiev, 15 refugees have been absorbed into a student body of 160, and the school provides tutors to help with the language difficulty as well as clothes and daily hot meals to take home. But though a psychologist visits the school weekly to meet with refugees, the school has treaded lightly in explaining the war to its students. Teachers are afraid of wading into a controversial subject, so they stick instead to biblical tales on the importance of welcoming guests. Jewish aid workers all say the Jewish community harbors less animosity toward Jewish refugees than Kievans in general. But the burden of helping Jewish refugees has fallen to international groups like IFCJ rather than local Ukrainian Jewish organizations. Donetsk Rabbi Pinchas Vishetsky, who has seen his city’s community dwindle from 10,000 before the war to 2,000 now, left for Kiev in August. He now manages the Donetsk community’s religious, educational and charity programs from afar, largely through IFCJ funding. He has given up hope of returning anytime in the near future.